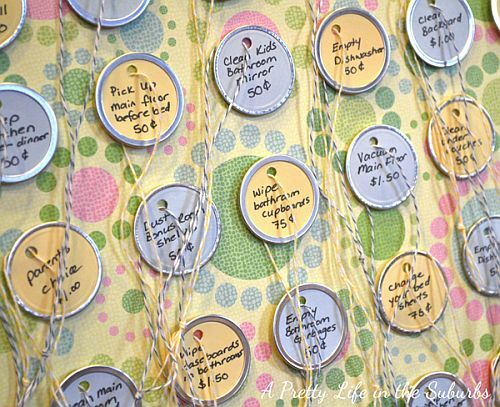 7 Quick Takes – Organization!!! I’ve mentioned before that I’m not the most organized person in the world, but I’m getting there! 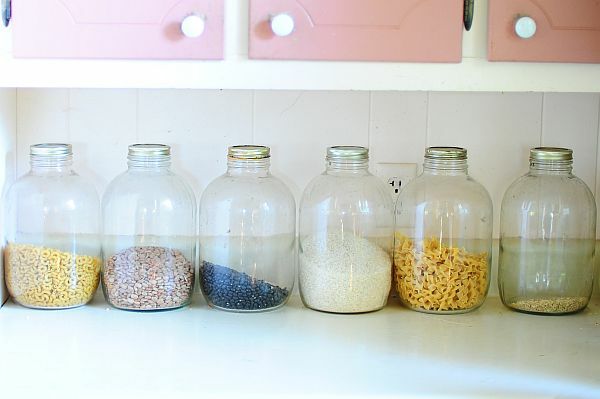 For the past few weeks, I’ve been drooling all over this organizational blog and this interior design/craft/recycling blog and I’ve gotten SO many ideas as to how I can make our space work better for us, and make things look nicer, too! Here are some of the simple changes we’ve made around here recently that have really made a huge difference! They’re not quite as nice as those you’ll find on these sites (baby steps, baby steps!) but they’re working for us! The workboxes themselves are just simple plastic file boxes we got from Office Depot and inside we have folders with each subject the kids are working on (more on this, in #3.) Our workbox materials (books they’re currently reading, violin/cello books, etc.) are located to the left of our workboxes, and our activity boxes are below. I’m working to get more stuff in our activity boxes, but for right now, they hold I Spy bottles, Cuisenaire rods (we didn’t get them from Amazon, but you can find them there) and a clothes pin color wheel for the little ones. To the right of our workbox shelf, we have miscellaneous project boxes which, at the moment, hold paint sets and stationary for writing cards, but hopefully will eventually hold more fun projects like sensory tubs, activity boards, and art baskets (along with a thousand other ideas I’ve gotten from this site.) 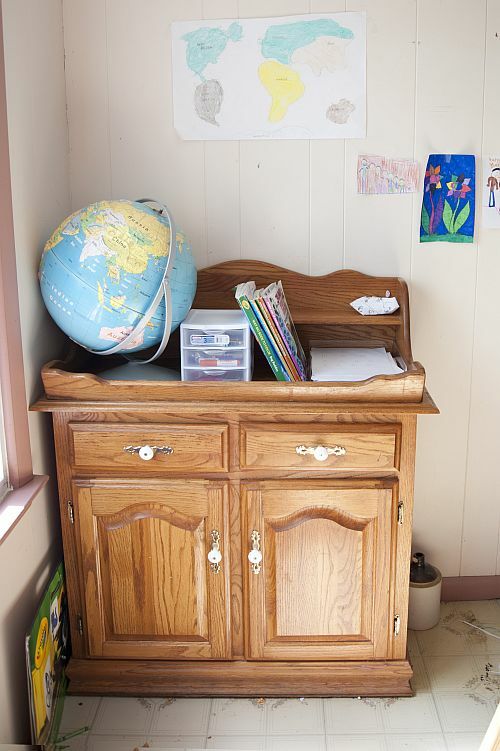 You can’t see it in this picture, but on top of the bookshelf is a letter tray, where the kids put their completed work, for me to review and correct as needed. And extra cards featuring subjects or activities we’re not working on that day are located in zip-lock bags in the back of their workboxes. 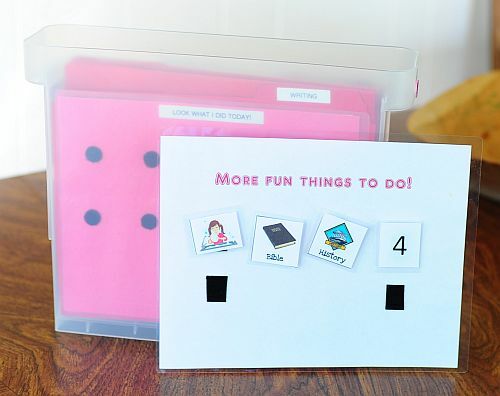 The number cards correspond to the activity boxes, so whenever the kids see a number card, they know to pull the activity box with that number and work with whatever is inside. 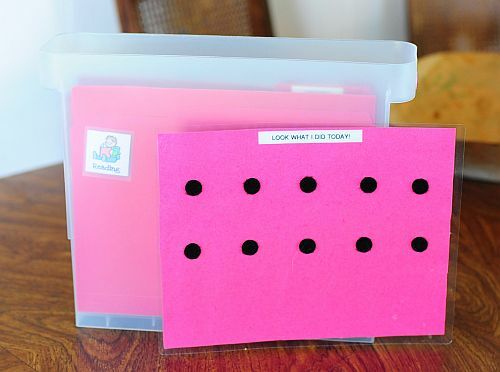 The folders inside the workboxes each have all the materials needed for that activity, unless the materials needed are too bulky (in which case they go in the activity boxes or the workbox materials box.) For instance, their reading folder doesn’t contain the books they’re reading, but it does contain the worksheets that correspond to their books. Their math folder contains the math CD they’re currently working on (we use Teaching Textbooks), scrap paper, and any support materials they need. 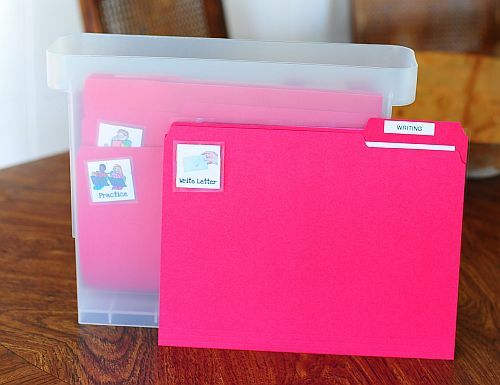 The math folders also contain multiplication flashcards, time worksheets, and number recognition flashcards for the kids working on those things. 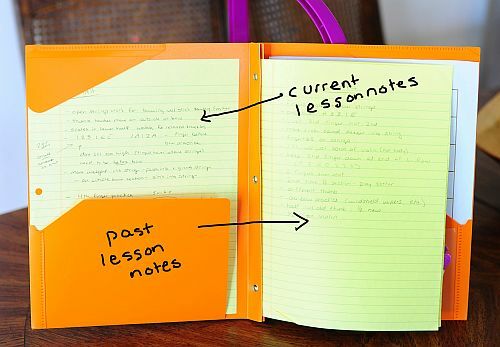 Writing folders will either have trace worksheets inside, or scrap paper to write a letter to a friend on, which I’ll check and correct before they re-write it on their stationary. 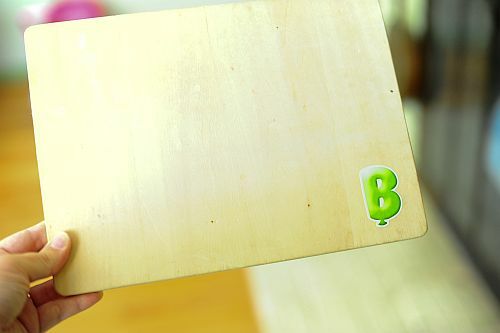 If they’re writing a letter, their writing folder will also contain a laminated sheet with the addresses of all the friends/relatives they like to write letters to. My favorite folder is the violin folder. We found these great Stay-Put Folders at Kroger, which were a bit pricey but well worth it! 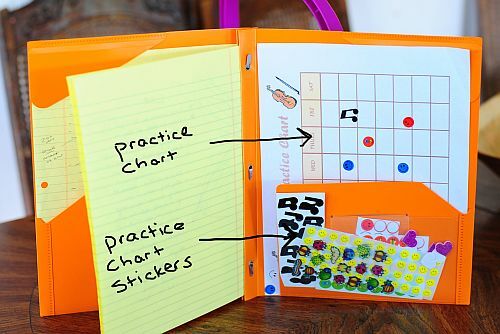 Inside, we have the kid’s practice charts, all the notes I take from each lesson, and stickers for their practice charts which are contained in a handy little pocket inside each folder. One great idea we came up with was to give the kids different stickers for the amount of time they practice. 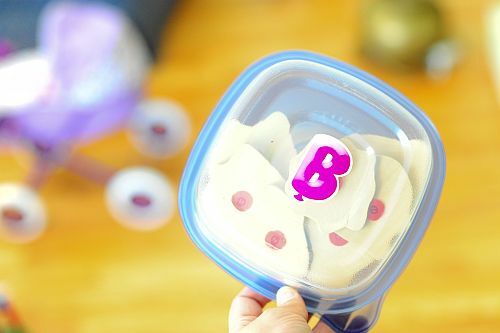 For short practices, they earn a plain little smiley face, but for long practices they have a variety of stickers to choose from – sparkly hearts, puffy insects, musical notes, etc. I’m not great about keeping their practice charts up to date (this one doesn’t have the amount of stickers it should), but the older girls really get into this and they LOVE to fill their charts with stickers! We put all our spare change in these, and this is what the kid’s allowance money comes out of each week. It’s nice, because we don’t have to budget for their allowance money and it also helps us to pay them a little each day, as they complete their tasks, rather than once a week. 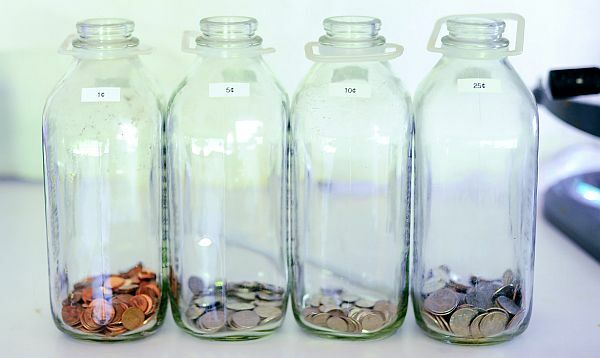 On Fridays when Jon gets paid, we change these out for dollar bills and put aside the kids tithe and offering money in special jars, until we have enough set aside to send somewhere. 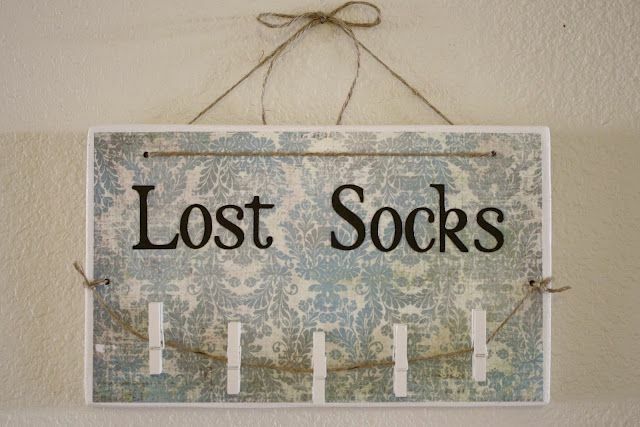 No more lost puzzle pieces! 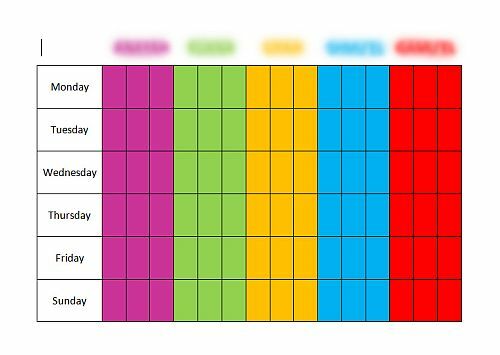 We also made this great “responsibilities” chart for the kids to mark off every time they get their chores done within the time frame allotted (we have trouble with one of our children procrastinating and playing during chore time.) If the kids earn an “X” in every box that week, they get a special treat on Monday! I take no responsibility for this idea, whatsoever. It was 100% God. 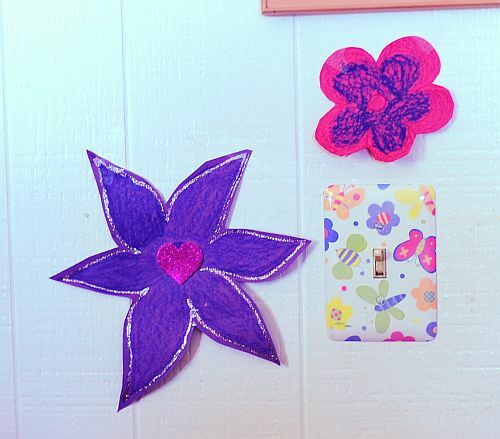 It doesn’t look like much, but this is what my kids and I are calling our “Restoration Wall.” Every time we have a situation come up where reconciliation just isn’t possible through talking (which seems to be the case much more often with this one child than with the others), we go and make a flower together. We don’t have to talk while we’re making it, we just sit and work together to draw and color and decorate the flower. When we’re done, we each write down on the back of the flower the thing that we did wrong, according to the other person. Once that is written, we scribble out each others words, kiss over each others words, kiss each other, and stick the flower to the wall. Eventually, we’ll either be gluing these flowers directly to the wall, or we’ll create some kind of big frame where we’ll display our flowers, permanently. The idea is that “love covers a multitude of sins” and by writing our wrongs down on the back of the flowers, scribbling them out, kissing them and then gluing them so that the words will never be seen again, we’re “covering” our sins symbolically and, I think, spiritually as well. Both times my daughter and I have made one of these flowers, she’s come into the project unwilling to talk and in tears, and left the table smiling and happy. I love it!!! 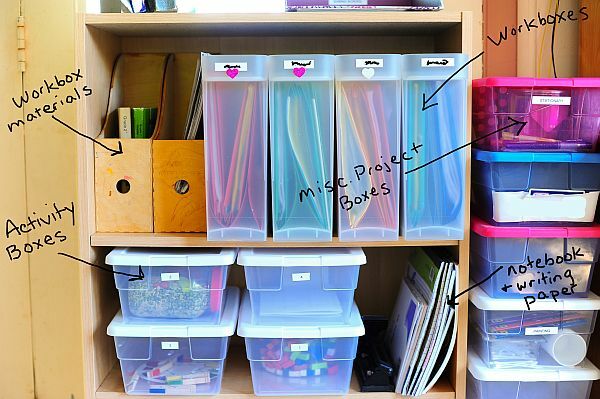 6 Responses to 7 Quick Takes – Organization!!! Rina, You do such a good job. I was an overorganizer (if that’s a word). There is a happy medium. But without some kind of order there is chaos. Even God in his infinite wisdom had a n order when he created the earth, He did it a little at a time in a specific order. 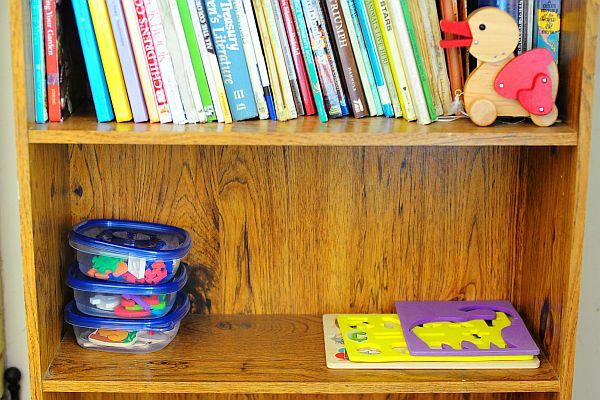 I had heard other homeschool moms say they didn’t want to organize their school, but I couldn’t understand. My child’s education was very important to me. I had a class room set up just like in schools. I had dry erase boards, bulletin boards, black boards, everything. One of my teachers in high school had actually become the liason for homeschoolers. Our classroom was set up in an extra office at our shop. He came in one day and told me that I would never have to worry about being reported, that I was dong everything right. It’s also so much easier if you have schedules and organization. We started school at a certain time and finished at a certain time, so the rest of the day could be planned. I wish I had had some of the ideas you have when I was homeschooling. Brandi is homeschooling Indigo and Golden. I went to the Abeka book display with her last year and she got so excited. She always wanted to be a teacher and I think she will do well with homeschooling. I hope you continue to do what you are doing. Do you do field trips? We did lots of them. Patti, the whole classroom set up is VERY new to me, but that’s pretty much the direction we’re going on, and I’m loving it! I’m definitely not an over-organizer, but it feels good to now be a semi-organizer! haha! I’m pretty blessed that I have all these other ladies to glean from, through friends and blogs and facebook, etc. etc. I definitely couldn’t have come up with most of these ideas on my own! We’ve done a few field trips, but I’d like to do more, especially now that the kids are a little older. There are so many places you can take them. I actually am friends with Sam Potter, so I took a group to court and we got to set in the jury stand and watch evrything going on. I think it scaed some of them, because they brought the people in in shackles. But a good lesson. I love zoos too. BGMU, water treatment plant, etc. The day just goes so much smoother when you are organized to a certain extent. When you know what you are going to do next, it makes it easier. Keep up the good work.